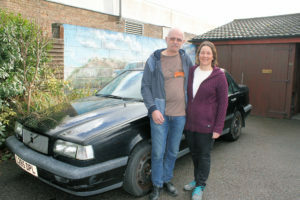 A MELKSHAM couple are preparing for the challenge of a lifetime, travelling 4,500 miles from Edinburgh to Rome, via the Austrian Alps, in a rusty old car. Richard and Caroline Aylward will be taking part in the ‘Rust 2 Rome Banger Rally’ in May, raising money for the Guide Dogs for the Blind Association. Joining them for the journey will be Richard’s friend from his army days, Ross Allen. The 14-day rally through Europe challenges those taking part to complete the journey in a car that costs no more than £500 to purchase and to prepare. “I love cars, vehicles, messing around with them, and this rally is an opportunity to do something different and unusual,” Richard told Melksham News. “However, it does involve camping, which is not my favourite thing to do – I thought I had left that behind a long time ago when I left the army. “I’ll be taking part with my wife Caroline and my friend Ross, who I know from my army days – we recently got back in contact with each other after 30 years. We feel pretty good about the challenge ahead, it’s exciting. It will be a learning experience for us. “But the real challenge for us is the car, a Volvo 850 saloon, although it’s not looking too bad, it looks solid – apart from the mileage on the car, it’s huge! “The car cost a lot less than £500 to buy, so we’ve got money left to play with to get the car ready. But we will certainly be taking a fairly extensive tool-kit – just in case. Ross and I both worked around vehicles in the army, which will come in handy – although we’ve not worked with Volvos before!